With a design aimed towards ultimate ease of use and synergy with Ableton Live, the Launchpad Pro from Novation looks like the real deal for a new approach to expressive performance. 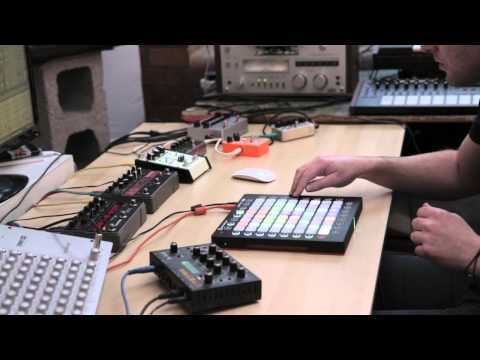 The Lauchpad Pro is built around a grid of 8×8 RGB colour coded, velocity sensitive pads, made to trigger and combine clips, played in the creation of beats and melodies and used to control and conduct external hardware. The Launch pad pro can be used in four simple modes, Session Mode, Note Mode, Device Mode and User Mode. This streamlined and user friendly approach is bound to be a hit with Able Live users who require a creative yet straight forward way to utilise and control the features and functions of Ableton in a live scenario, without losing your focus on creativity and performance. In Session Mode, you can immediately trigger and combine clips, in Note Mode you have the ability to create dynamic beats and loops, playing the pads as instruments. In Device Mode, effects and processing can be applied to your tracks and finally in User Mode you can create and save your very own custom layouts and settings across the pad. All these functions can be performed at the touch of a button, so you really can keep your mind on your sound rather than worrying about cycling through tons of menus and routing lists on your laptop. The Launchpad Pro is ideal for carrying around, being lightweight and compact yet rugged, it can even be powered by USB bus power if you don’t want to carry the PSU with you. It ships with a copy of Ableton Live Lite, plus 1 GB of Loopmasters Samples and Bass Station and V-Station plug-in synths so you can get going straight out the box. If you want to delve even deeper into the Launchpads capabilities, you can chain several pads together and utilising Max for Live the sky really is the limit. We’ll be getting more info on this product and many more over the next few days so keep your eyes on the dv247 magazine to keep up to date with all the latest developments at NAMM 2015.